One part of a recovery from addiction is to create an ambiance and a lifestyle that will favor the vibrational frequency increase. By incorporating therapeutic habits in our daily life, we can create that ground for a healing process. To make sure the healing will work, like losing excess of weight, you need proper food diet and exercise. Here, the exercise part would be the techniques to increase the vibrational states. In a previous article, 20 WAYS TO RAISE YOUR VIBE… we overview techniques that will help to raise our frequency and get away from dark entities influence of inflicting destruction upon others and various nastiness (ritual, sacrifice, etc.). When we suffer from addiction, we accept to destroy ourselves, nobody else. Not hurting somenody else does’nt mean we do all right. We are still under a negative influence and to be able to fly free and become who we are meant to be, we need to create and absolute positive environment. As for to lose excess of weight, we need also the right food. Here the food would be to absorb specific lenghtwave frequencies from outer sources. Not only vibes from sound or music, but also from food, essential oils, colors, rocks, yoga and positive affirmations. We need therapy. As for nutrition or diet sciences, just to say we eat well does not ensure at all we will reach goals. Each one of us has a particular metabolic state, and need a specific food combination regime. In addiction therapy, each therapy has a frequency and each frequency plays a role. That’s why we need to pay attention for the proper therapy adapted for our own chakras state. 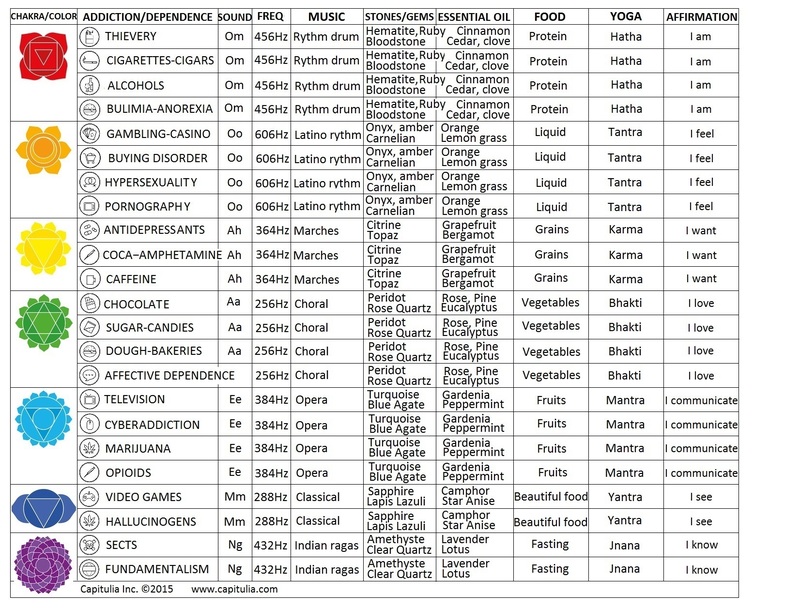 The table in the figure below, although filled with a lot of information, does not contain all elements for each music styles, stones, essential oils, food and affirmations, but only the most common and unanimous ones. You need to do your own search to find more about therapies. Perhaps, if you stick with the appropriate therapies for your dormant (underactive) chakra(s), you should protect yourself from negative influence and recreate a permanent and continuous flow of good vibes to supply your own vibrational frequency up and downs, since nobody can maintain a perfect state all the time. We could have come with a longer list. The combo alcoholism-sexolism-work holism is often associated with the first three chakras. Right brainers are too frequently afflicted by these three. As we have seen, alcoholism refers to the first chakra and sexual disorders to the second chakra. As to work holism — addiction to work — the feeling of lack of power, but not powerlessness, triggers an excessive reaction. Because it’s confusing when it comes to determine whether it is an addiction or an excess, because it’s both, we will discuss it in the next article. With the therapies we just covered, you will be able to stabilize your environmental frequency steady state. In the next article of this series, we will discuss about overactive chakra excess and how to prevent them.